DARK SKIN COLOUR AND pigmentation abnormalities play a very important role in skin appearance and self-confidence. Asian women commonly desire to have a brighter skin colour1. Hydroquinone, the gold standard for a depigmenting agent, raised concern about its safety profile and was associated with some adverse side-effects. This has prompted research to find other therapeutic agents for hyperpigmentation2. Studies using single topical tranexamic acid have been performed as hyperpigmentation therapy (melasma) showed a decrease in the MASI score (Melasma Score Index)3. In recent years, the approach to skin lightening has broadened. The strategy of using a single agent to inhibit tyrosinase has recently been modified by the use of combined actives with different target mechanisms. Galactomyces Ferment Filtrate (GFF) reduces the appearance of skin pigmentation by reducing melanin synthesis and oxidative stress in melanocyte cells4. Niacinamide, which in addition to being a tyrosinase inhibitor, also plays a role in blocking the transfer of melanosomes to keratinocytes5. 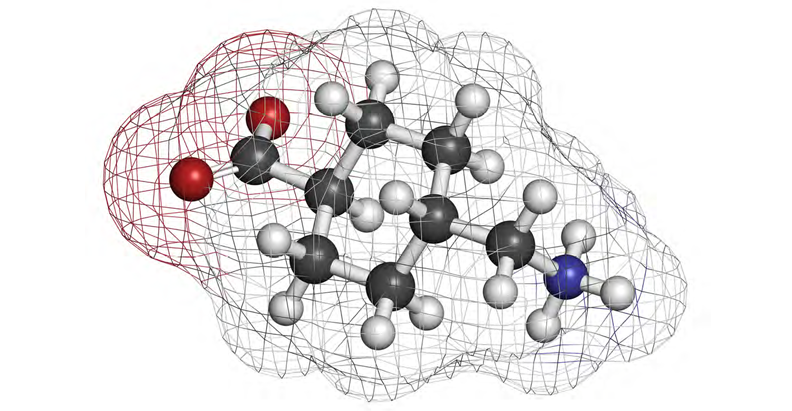 Arbutin is a natural derivative of hydroquinone found in plants and has a mechanism of action of melanosomal tyrosinase inhibition at non-toxic concentrations6. In this study, the investigators aimed to compare the effectiveness of tranexamic acid 3% combined with other skin lightening ingredients, such as galactomyces 2%, niacinamide 4%, and alpha arbutin 2%, which are expected to exert better whitening activity versus that of 4% hydroquinone preparation and placebo. 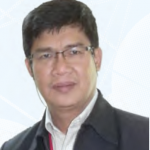 A 4 week double-blind, randomised controlled clinical trial study was conducted at the Dermatovenereology Department of Hasanuddin University, Makassar, South Sulawesi Province, Indonesia. Forty-four female Indonesian volunteers aged 25–50 years were enrolled. Samples were collected through a consecutive sampling method with the following inclusion criteria: Fitzpatrick’s classification of skin phototypes III to V and willing to participate in the study by signing the informed consent form. Exclusion criteria were pregnancy/lactation, the presence of other dermatoses on the arm, history of hypersensitivity to the substances used in this study, prior exposure to medical procedures or depigmenting agents on the face within 1 month prior to the study, and use of tranexamic acid within 3 months prior to the study. The subjects were given an explanation about the study, and those who agreed were asked to sign an informed consent form. All patients enrolled in the study were instructed to refrain from applying any other product on their forearms besides those that were given in this study. Subjects in the experimental group received three identical containers of topical serum formulation containing combination of tranexamic acid 3% serum (tranexamic acid 3%, galactomyces ferment filtrate 2%, niacinamide 4% and alpha arbutin 2%), hydroquinone 4% serum, and placebo. The containers were coded as A, B, and C. To ensure the same application site, a special cover with template holes was made for each application site. The first two templates, coded (A) and (B), were placed on the outer side of the right forearm. The other template, coded (C), was placed on the outer side of the left forearm. The cover was made of an elastic material with two template holes, the first hole — marked (A) for the right forearm and (C) for the left forearm — was placed a distance of 4 cm from the cubital fossa, while the second hole (B) was 4 cm from the first hole (A). Serum A, B, and C were applied on the template hole (A), hole (B), and hole (C), respectively. Every morning and evening, each subject applied one drop of each serum to the appropriate site. Subjects were assessed at baseline and each week for four consecutive weeks. During each visit, subjects were asked to bring their templates and place the templates on their forearm as they did every day to apply each serum. Skin pigmentation was then assessed using a chromameter (CR-400, Minolta, Japan) to measure skin brightness and Individual Topography Angle (TIA). All measurements were taken four times, and the mean value was used. Ethical clearance of this study was approved by the Biomedical Research Ethics Committee on Human Medicine Faculty of Hasanuddin University (approval number 1019/H4.8.4.5.31/PP36-KOMETIK/2017). Informed consent was obtained from all subjects. Adverse effects (AEs), such as pain, itching, and redness, were queried at each visit by the dermatologist. The chromameter provides three variables: L, a, and b. Brightness ranging from 0 (black) to 100 (white), a (degree of redness), and b (variation in colour between blue and yellow) where lower values indicate a darker skin and higher values a lighter skin. The authors also calculated the Individual Topography Angle (ITA) (Arctg [(L-50/b]x180/3.1416), which is an index that measures the skin pigmentation. All 44 subjects completed the study. Data were analysed and tested using a one-way analysis of variance (ANOVA) test. Baseline data showed that out of the 44 samples, there were twenty-six subjects (59.1%) in the less than 30 years-old group, fourteen subjects in the 30–39 years old (31.8%) group and four patients in the >40 years (9.1%) group. 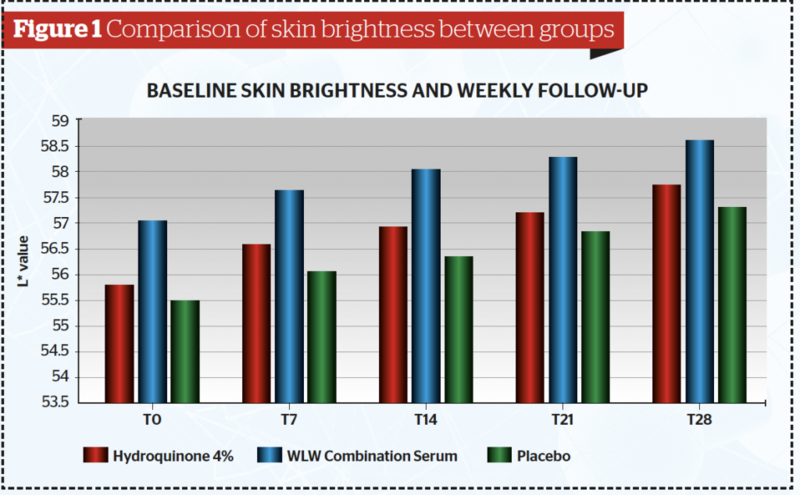 Table 1 and Figure 1 show after 4 weeks of application, the mean skin brightness score was found to be highest for the combined serum (58,60) and lowest on serum B containing placebo (57,33) (p <0,05). The skin brightness for the combined tranexamic acid serum was superior to that of the hydroquinone serum. 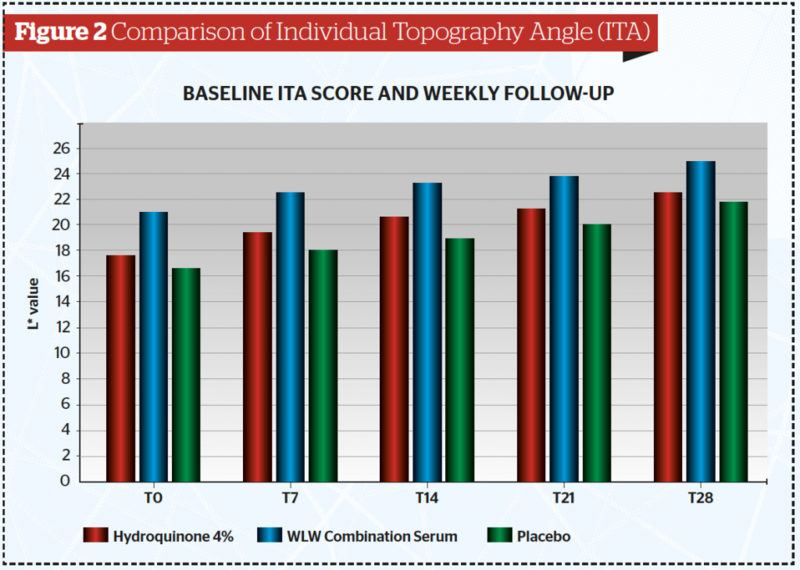 From this study, the authors calculated the Individual Topography Angle (ITA) (Table 2 and Figure 2) and found the mean ITA index at the end of the study was significantly higher in the combined tranexamic acid serum (24,79) and lowest for the placebo serum (21,72) (p<0.05). 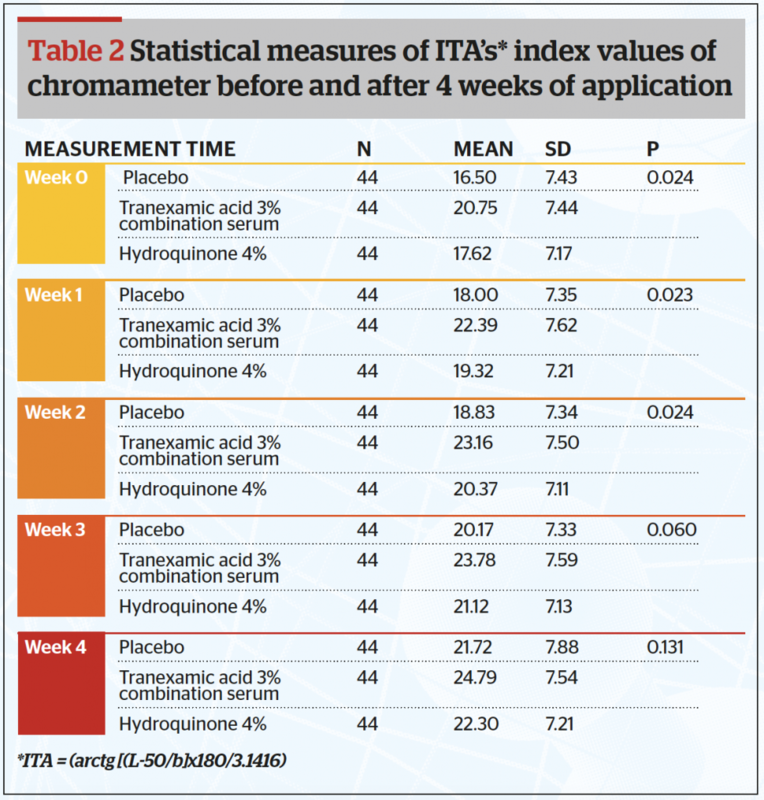 It is also clear that the ITA for the combined serum is higher than that of the hydroquinone serum. No specific adverse events were observed during the study period. The results of this study were consistent with that of Kim et al. 2016, where they also examined the efficacy of topical tranexamic acid as a depigmentation agent. Several studies have been performed to find possible mechanisms of action of tranexamic acid as a melasma treatment. Ultraviolet exposure increases plasminogen activator production by epidermal keratinocytes in situ, resulting in the secretion of melanogenic factors such as prostaglandins. Tranexamic acid (trans-4-aminomethyl cyclohexanecarboxylic acid) exerts its effects on melasma by reversibly blocking lysine binding sites on plasminogen7–9. Tranexamic acid is a natural plasmin inhibitor that blocks the conversion of plasminogen to plasmin. The drug accomplishes this through the inhibition of plasminogen activators by creating a reversible complex with plasminogen10. 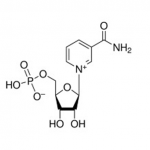 Plasmin is a protease that enhances the intracellular release of arachidonic acid (AA) and alpha-melanocyte-stimulating hormone (α-MSH). AA and α-MSH have the property of stimulating melanogenesis by melanocytes. Tranexamic acid, being a plasmin inhibitor, depletes the keratinocyte pool of AA involved in UV-induced melanogenesis8,11. The topical application of tranexamic acid has demonstrated a reduction in UV-induced hyperpigmentation12. 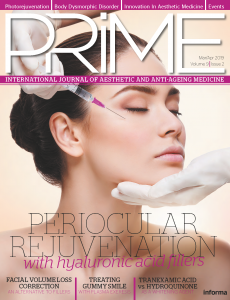 Topical tranexamic acid shows rapid and more sustained results with very minimal adverse effects as far as epidermal melasma is concerned, and the drug has been proven to have almost similar cumulative effects of hydroquinone and dexamethasone13. Galactomyces ferment filtrate (GFF) is known to reduce the appearance of skin pigmentation by reducing melanin synthesis and oxidative stress in melanocyte cells4. Niacinamide has been known to inhibit the transfer of melanosomes from melanocyte cells to keratinocytes. Clinical trials using niacinamide have shown that this substance can significantly reduce the total area of hyperpigmentation and improve skin brightness after 4 weeks of use14. An in vitro test showed α-arbutin has an effective inhibitory effect of tyrosinase. The extraordinary efficacy of α-arbutin is due to its perfect affinity for the active site of tyrosinase6. 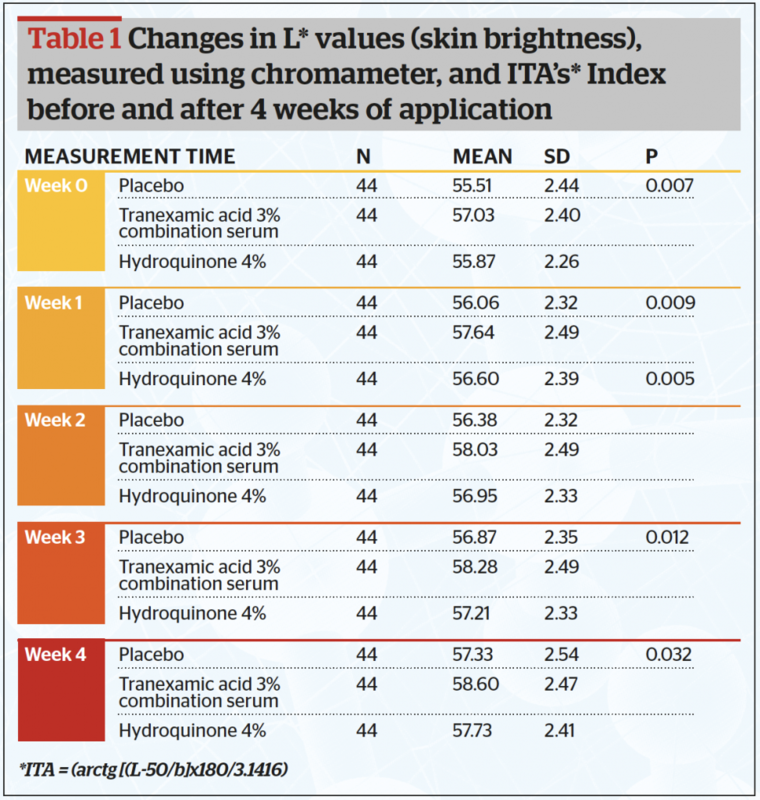 This study demonstrated that at various time intervals, skin brightness and ITA measured by Chromameter for the combined tranexamic acid serum (containing tranexamic acid, galactomyces ferment filtrate, alpha arbutin and niacinamide) is consistently higher than that of hydroquinone 4% serum as well as the placebo serum. The enhanced synergy of tranexamic acid with galactomyces ferment filtrate, alpha arbutin and niacinamide enable it to be superior to that of hydroquinone in term of whitening efficacy with no side-effect. The result of this study has an important implication that by having the right combination of several whitening agents with different whitening mechanisms, it is possible to have an alternative whitening agent as powerful as hydroquinone, which has been the gold standard for many years. The combined tranexamic acid serum can be a good alternative to hydroquinone since there were no side-effects observed during the study. However, more studies will have to be performed for more extended periods of time and for various skin pigmentation disorders. This study showed serum containing a combination of tranexamic acid 3%, galactomyces ferment filtrate 2%, niacinamide 4% and alpha arbutin 2% can be considered as a safe and effective alternative to increase skin brightness with no significant side-effect. Declaration of funding No funding or sponsorship was received for this study or publication of this article. Declaration of financial/other relationships All authors have no affiliation with or financial involvement in any organisation or entity with a direct financial interest in the subject matter or material discussed in the manuscript. Tse TW, Hui E. Tranexamic acid: an important adjuvant in the treatment of melasma. J Cosmet Dermatol. 2013;12(1):57-66. Hakozaki T, Minwalla L, Zhuang J, Chhoa M, Matsubara A, Miyamoto K, et al. The effect of niacinamide on reducing cutaneous pigmentation and suppression of melanosome transfer. Br J Dermatol. 2002;147(1):20-31.